Iran is mainly a high plateau located between the Caspian Sea, the Persian Gulf and the Gulf of Oman, with nearly 30 percent of the border on the coast. Her neighbors are Azerbaijan, Armenia and Turkmenistan to the north, Pakistan and Afghanistan to the east and Turkey and Iraq to the west. The central plateau is actually a tectonic plate where earthquakes are common. Surprisingly, the climate in Iran is one of extremes, from subpolar to subtropical, with temperatures ranging from -40 degrees to 130 degrees Fahrenheit. With mountain ranges surrounding the plateau, skiing is one of Iran’s best kept secrets. The arid interior is home to two deserts that dominate the eastern part of the country. Iran’s rich history, starting with the Persian Empire, a major superpower, has included many conquerors and influences along the way. It was the Safavid Dynasty which established Shi’a Islam as the official religion of their empire in 1501; a major turning point in the history of Islam. Iran, from that point forward, was a monarchy ruled by a shah, or emperor, nearly without interruption, until the 1979 revolution. The “Iranian Revolution” led by Ayatollah Ruhollah Khomeini, transformed Iran from an absolute monarchy to an Islamic Republic. A new theocratic constitution was formed and Khomeini became the Supreme Leader. The ideology of the revolutionary government was populist, nationalist and Shi’a Islamic. Khomeini’s reign, until his death in 1989, had great impact around the world. The era was dominated early on by the Iran hostage crisis, when 52 American hostages were held for 444 days by Iranian students who labeled the US embassy personnel as a “Den of Spies.” The takeover was very popular in Iran and thousands regularly gathered in support of the hostage takers. It was at this time that Khomeini started referring to America as the “Great Satan.” Needless to say, this severely damaged relations with America, and Iran has suffered massive sanctions ever since. Industry was nationalized, laws and schools converted wholly to Islam, and Western influences were banned. This was also the time of the very costly and bloody war with Iraq. Hundreds of thousands lost their lives, including women and children. Saddam Hussein (Iraq’s dictator) unleashed chemical weapons on the people of Iran. This war left many scars on the people of Iran. There have been recent developments between six world powers (including the US) and Iran in hopes of lifting sanctions, along with an agreement that limits Iran’s ability to produce a nuclear weapon. This is a major breakthrough in foreign relations and may bring good growth opportunity to the citizens of Iran. Iran has a very young population, with over 80 percent of its estimated 81 million people, under the age of 40. Recent uprisings from the youth may be slowly reforming some of the government’s very strict policies. Most of Iran’s population is Persian, however there are also ethnic Kurds, Arabs, Azeris, Lurs, Turkmen and Turkic tribes. The official language is Persian, or Farsi, but other languages are spoken based on the people’s ethnicity. The official religion is overwhelmingly Shi’a Muslim, with a very small minority of Sunni and others, such as Zoroastrian, Jewish and Christians. Iran is home to 19 significant UNESCO world heritage sites, both pre and post Islam, with many additional places on the “tentative” list. From the Throne of Solomon to the Wonders of Persepolis, there is much to see and explore in Iran. Iran’s main export is oil but they are known for their beautiful Persian rugs and perhaps the finest caviar in the world. 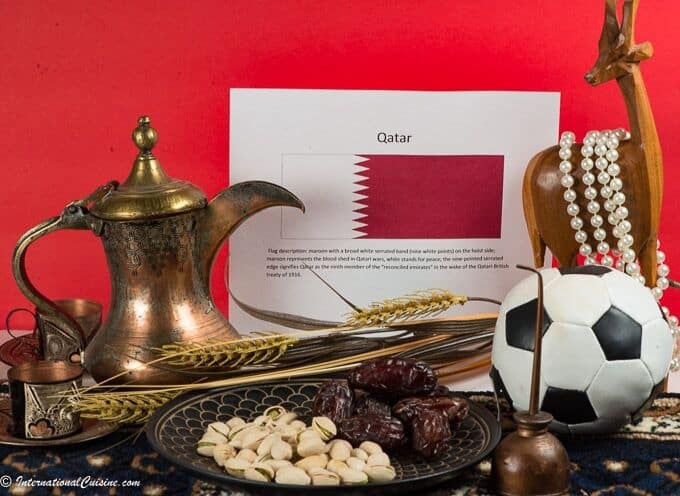 They are also exporters of fruits, nuts, cotton and saffron. Iran used to be primarily a rural society, where nature was of the utmost importance. Even today, with fast growing urban centers, and even in the very populated capital city of Tehran, many Iranians try to bring the outdoors inside with intricate flower and animal motifs. Fresh flowers and fruit designs are part of every celebration. Iran is the only nation on earth that celebrates the New Year on the Spring Equinox and the only nation in the Middle East that uses the solar calendar. In Iranian culture there is what is known as the inside and outside. The inside, or andarun, is the most private of space. It is where family members are most relaxed and are able to behave in a free manner. The outside, or biruni, is the public space, where social niceties must be observed. Almost all the architecture is designed with the principle of biruni in mind. Families create both spaces inside their homes and often one room or space can be quickly transformed as needed. Iranians are known for their incredible hospitality where they are prepared to entertain overnight guests at a moment’s notice. Shopping is done at The Bazaar and at the head of every Bazaar is a mosque; a gathering place at the heart of the Islamic faith. The Bazaar is set up with like merchants in the same location and the Bazaar is where one can find anything you would need for everyday living. Friday all the shops are closed. In Iran the most visible mark of the Islamic Republic is the dress. Women are required to wear a hijab, which means cover or curtain. They must cover their head, and neck with a head scarf, called a roo-sari and a formless, knee length coat, known as a roo-poosh, plus a long dress or a pair of pants. Modesty is key and at holy sites women are required to wear the chador, a full length swathe of black cloth designed to cover everything but their face from view. (Iran has a large number of women who get nose jobs, as the face is often times all that can be seen in public). Western wear may be worn underneath a chador or while at home in the private space. Men are prohibited from wearing shorts or tight jeans. Foreigners traveling to Iran should be mindful of this protocol while visiting there, as the penalties can be severe. As we look into the cuisine of Iran, known throughout the world as Persian cuisine, we are in for a treat. Iranians have a healthy diet, with fresh fruits, greens and vegetables always the mainstay. Meat is generally a condiment, usually lamb, or chicken. Rice and whole grain un-leavened breads are staples. Pork is prohibited, as is alcohol, although local moonshine can be found in some communities. Black tea is ubiquitous and tea houses can be found all over the country. The influences are a combination of Greek, Indian, Azeri and Turk, yet the food has a flair all its own. Iranians believe that food is either hot or cold, not in temperature but rather the affect the food has on the body. It is a belief that originated in ancient times from the Zoroastrian religion. It is thought that food is a fuel which either weakens or strengthens the body. Some foods slow the digestive process and others speed it up; it is a balance between the two that is sought. The whole idea is to create a balance of neutrality. The result is delicious combinations of flavors and great nutrition. We set our Persian rug on the floor with a shorbeh, or dining cloth, along with cushions to sit on. Although dining tables are not uncommon in modern Iran, it is often customary to sit on the floor cross-legged, to enjoy the family style meal. 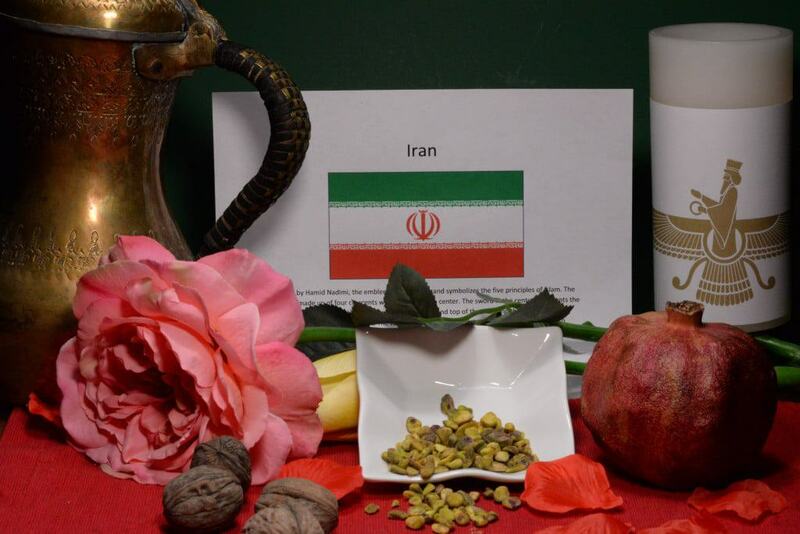 We decorated with pomegranates and nuts as well as a candle with the symbol of Faravahar, a religious cultural symbol from the Pahlavi Dynasty. 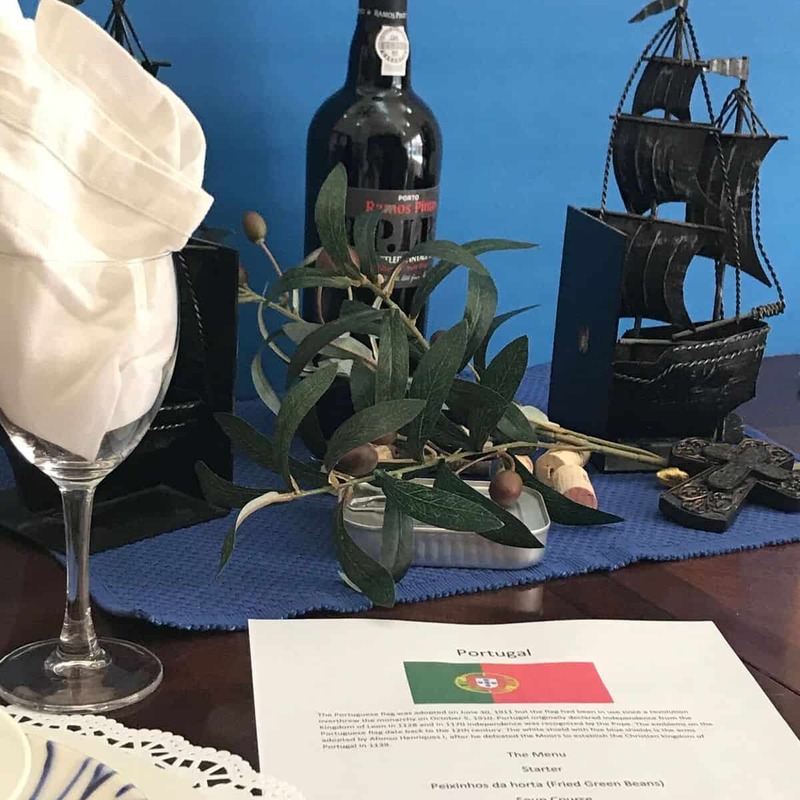 Roses and tulips also adorned the setting, as they are both considered national flowers. Forks and spoons are used but only with the right hand, as the left is considered unclean; despite a handwashing ritual before the main meal. In Iran there is something called “Taarof.” It is a system of politeness that includes both verbal and non-verbal communication. If you are offered something, like tea or a sweet, even if you want it, you should decline it until further insistence. If you are invited into a home for a meal, you are expected to decline awaiting further prompting but you should accept multiple helpings at mealtime. Iranians will also protest compliments in an attempt to always appear humble. You should leave a little food on your plate when you are done eating or they will assume you want more, even if you decline; remember, Taarof! We began the meal with “Befarma’id” (which means Bon appetite in Farsi). Warm, naan bread was served to dip into the eggplant walnut dip, called Kaske Bedmjan, as the starter. 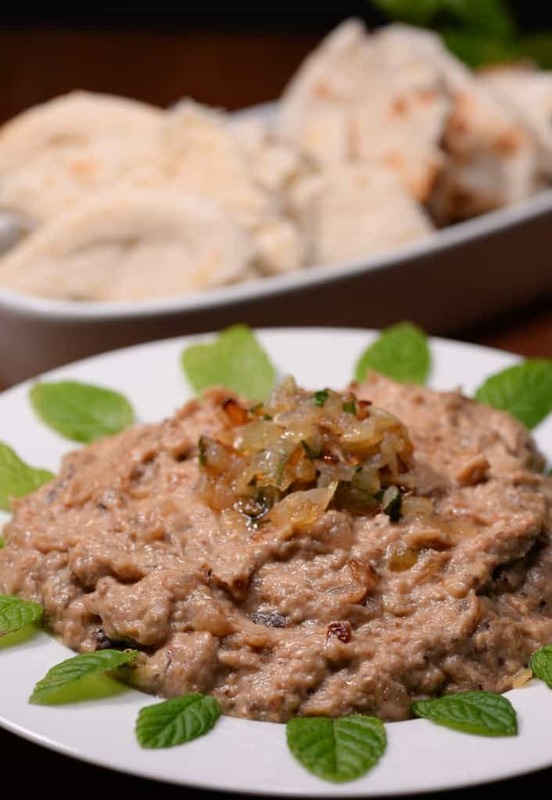 Eggplant is considered the potato of Iran and the preparation with the walnuts and kashk (a cultured farmers cheese), made for a creamy, delicious dip. It was topped with caramelized onions and was simply divine. Next was the Ash-e-Reshteh, a traditional noodle soup that is often served for New Years. It is customary in Iran to serve noodles before embarking on anything new. 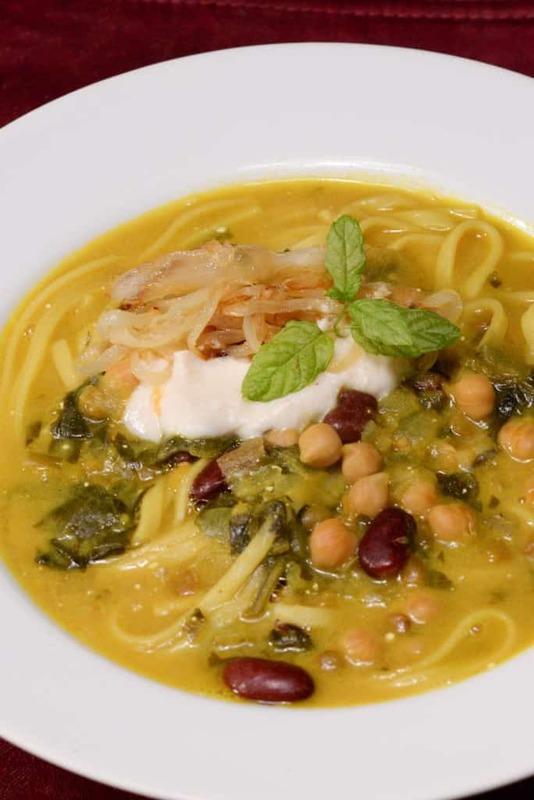 The soup, with many different types of legumes, is hearty and wonderful. Seasoned with turmeric and saffron, it makes for a beautiful presentation as well. Reshteh, is an egg noodle, found in Middle Eastern stores, somewhat similar to linguine. The soup is also topped with a little kashk; that wonderful, creamy, farmers cheese, yum! For the main course we savored a dish called fesenjan. Although the national dish of Iran is considered to be chelow kabab (a dish consisting of steamed saffron, seasoned basmati rice and kabab, usually lamb, served with roasted tomatoes), this dish came in as a close second. 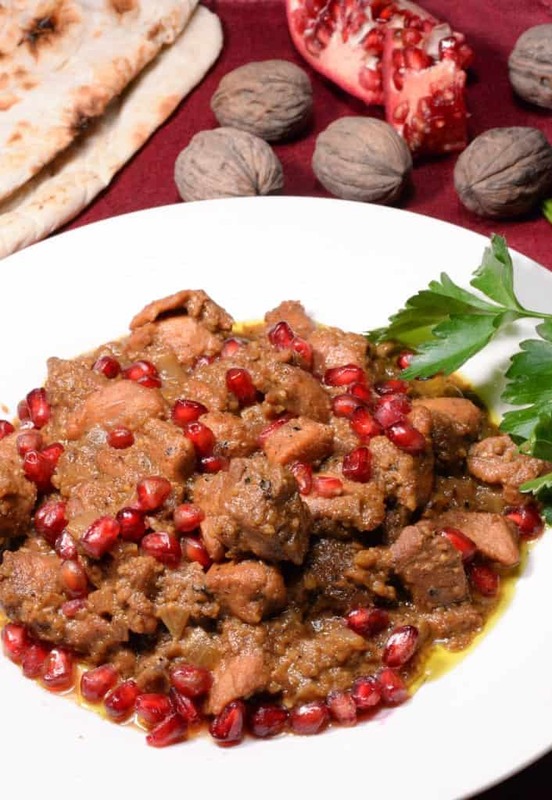 Fesenjan, an amazing chicken dish, made with pomegranate molasses and walnuts, is a worthy dish to impress guests anytime. It is simply delicious. This main course was served with Javaher polow, or jeweled rice, an absolutely beautiful dish that is equally tasty. 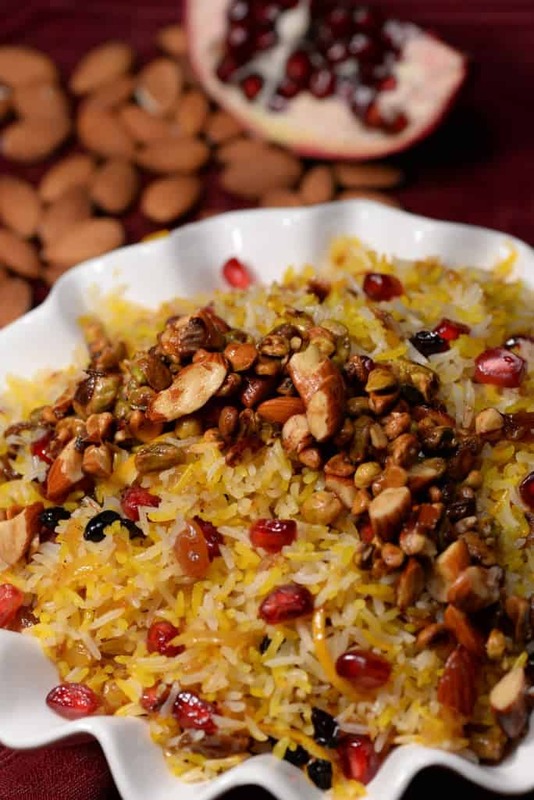 The rice is seasoned with typical Iranian flavors such as saffron, cinnamon, cardamom, allspice, and cumin then embellished with dried apricots, barberries, raisons, almonds, pistachios and yes, pomegranate. 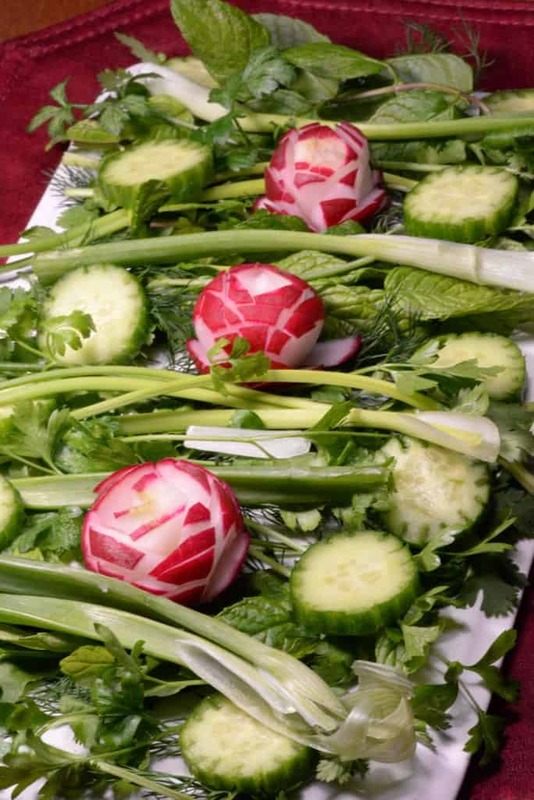 Sabzi Khordan, a condiment comprising fresh herbs and vegetables (found on every Iranian table), provided the perfect garnish. The herbs and vegetables change based on what is fresh and in season. Ours had radish, cucumber, dill, coriander, mint and parsley. For dessert, Iranians love sweets of all kind and ice cream, is no exception. It is usually served in-between two pieces of wafer. 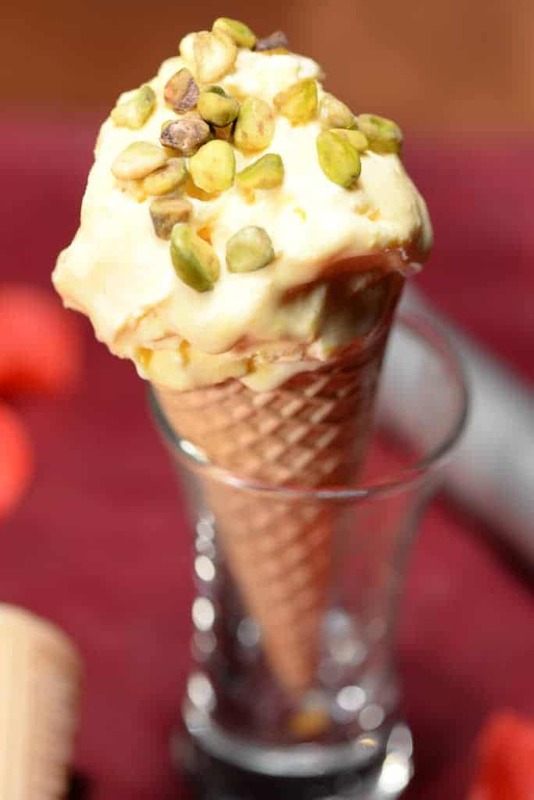 Ours was a delicious, saffron ice cream, served in a cone, topped with pistachios…. Divine!